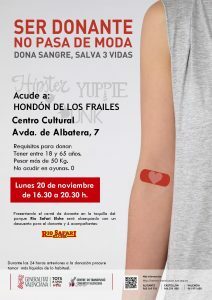 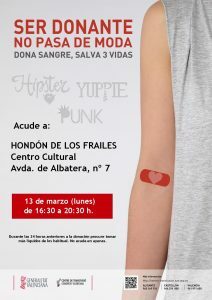 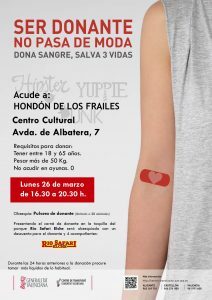 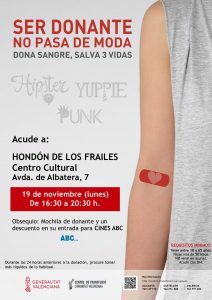 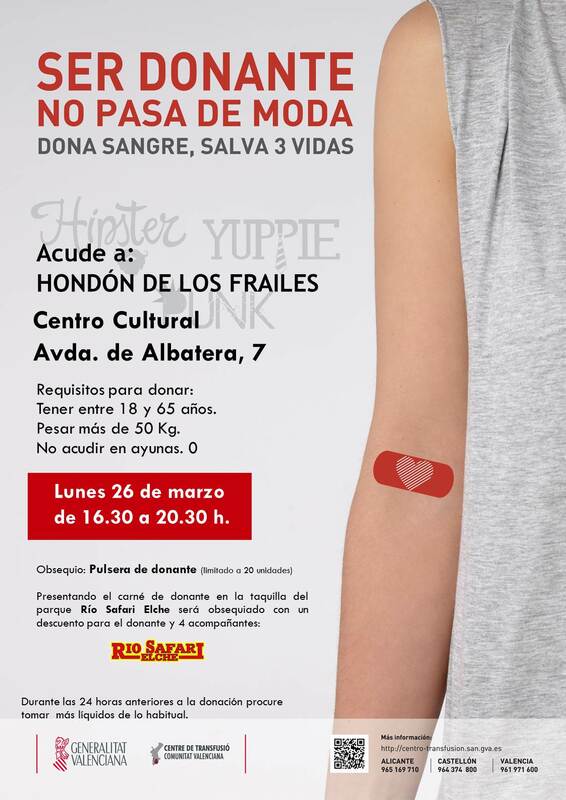 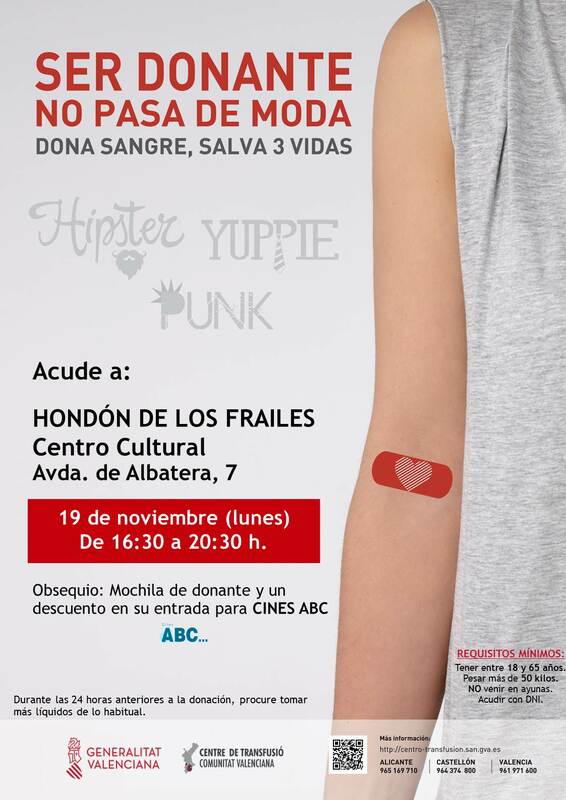 DONACIÓN SANGRE: LUNES 26 DE MARZO – CENTRO CULTURAL- DE 16.30 A 20.30 H.
TE INVITAMOS A ACUDIR A DONAR SANGRE EL PRÓXIMO DÍA LUNES 26 DE MARZO DE 16.30 A 20.30 h. EN EL CENTRO CULTURAL DE HONDÓN DE LOS FRAILES, DONDE SE DESPLAZARÁ UNA UNIDAD MOVIL DEL CENTRE DE TRANSFUSIÓ. DONACIÓN DE SANGRE: LUNES 17 DE JULIO – CENTRO CULTURAL – DE 17.30 A 20.30 H.
TE INVITAMOS A ACUDIR A DONAR SANGRE EL PRÓXIMO DÍA LUNES 17 DE JULIO, DE 17.30 A 20.30 h. EN EL CENTRO CULTURAL DE HONDÓN DE LOS FRAILES, DONDE SE DESPLAZARÁ UNA UNIDAD MOVIL DEL CENTRE DE TRANSFUSIÓ. DONACIÓN DE SANGRE: LUNES 13 DE MARZO – CENTRO CULTURAL – DE 16:30 A 20:30 H.
TE INVITAMOS A ACUDIR A DONAR SANGRE EL PRÓXIMO DÍA LUNES 13 DE MARZO, DE 16:30 A 20:30 h. EN EL CENTRO CULTURAL DE HONDÓN DE LOS FRAILES, DONDE SE DESPLAZARÁ UNA UNIDAD MÓVIL DEL CENTRE DE TRANSFUSIÓ.